Disclaimer: This post is sponsored in conjunction with #BrunchWeek. I received product samples from sponsor companies to aid in the creation of #BrunchWeek recipes. All opinions are mine alone. Sweet rolls were an immediate given when I received packets of yeast from Red Star Yeast and sugar from Dixie Crystals. I wanted to do something different this time and not include the standard cinnamon/sugar/butter mixture in the middle and have fruit there instead. It paid off rather well considering I had two coworkers come over to me the morning I brought them in and tell me it was the most delicious thing they had eaten in weeks. Raspberries are added to these sweet rolls for the perfect summer taste. 1. In the bowl of your stand mixer, combine yeast, water, and sugar and allow to sit for 15 minutes. 2. Meanwhile, cut two rounds of parchment paper to fit in the bottom of 2 8-inch round cake pans. Place the parchment in the pans and spray with non-stick cooking spray. 3. Prepare the filling mixture by tossing blueberries and raspberries in a bowl with sugar and cornstarch until coated. Set aside. 5. Add salt and butter to the yeast mixture in the stand mixer. Mix with a dough hook and add flour ½ cup at a time until a soft dough forms. Add more flour if needed. Dough should be tacky, but not sticky. 6. Turn out the dough onto a lightly floured surface and divide into two pieces. Roll out each piece into a 9×11 rectangle. 7. Spread half of the berry mixture ½ inch from one edge, lengthwise. 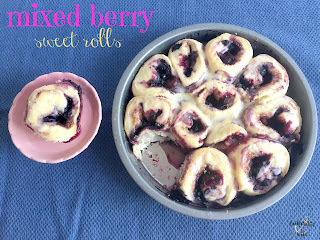 Pull the border over the berry mixture and keep rolling dough up tightly. Repeat with remaining dough. 8. Slice each log into 6-8 evenly sized rolls and place in the prepared baking pans. Let rest for 5 minutes. 9. Bake for 15-18 minutes or until the tops of the rolls are golden. 10. Remove from the oven and place pans on a wire rack. 11. 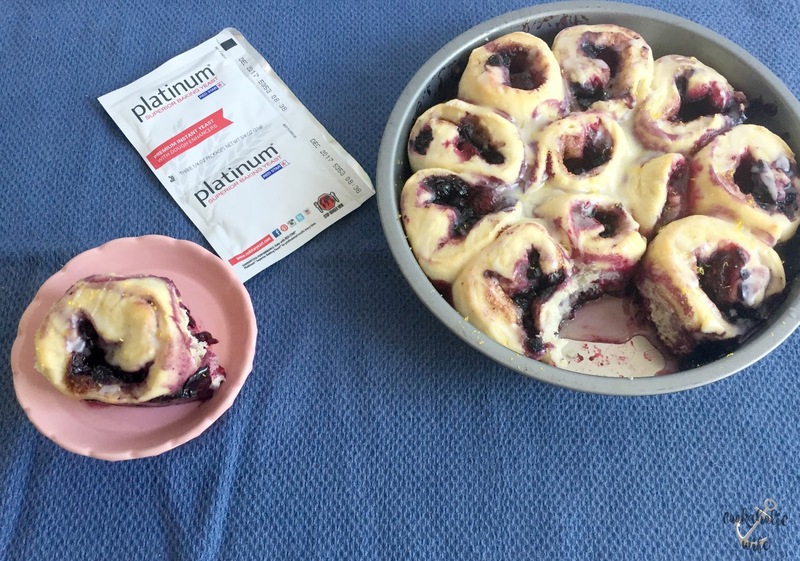 Prepare the glaze by combining the cream cheese and powdered sugar together in the bowl of a stand mixer and mixing on low speed until fully combined. Add in milk a little at a time until the glaze reaches a consistency where it can be poured over the rolls. 12. Pour glaze over the rolls and enjoy warm. Uneaten rolls can be refrigerated for 2-3 days if covered. Reheat by microwaving in 30 second intervals. Additional glaze may need to be added if rolls are dry. 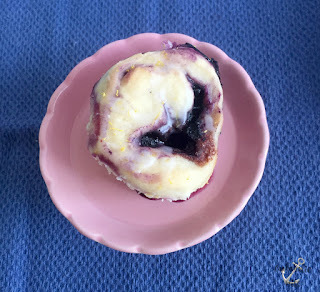 You can easily change out the fruit in this recipe with whatever you have on hand, although I would probably stick with options that are smaller and can be easily rolled up. I ended up making a small batch of these for Tom with some leftover strawberries we had. Disclaimer: Thank you to the #BrunchWeek sponsors, Red Star Yeast, Dixie Crystals, Cabot Cheese, Nielsen-Massey, Rainier Fruit, and Michigan Asparagus for providing the prizes free of charge. These companies also provided the bloggers with samples and product to use for #BrunchWeek recipes. All opinions are my own. The #BrunchWeek giveaway is open to U.S. residents, age 18 & up. All entries for the winner will be checked and verified. By entering you give the right to use your name and likeness. The number of entries received determines the odds of winning. Six winners will be selected. The prize packages will be sent directly from the giveaway sponsors. The #BrunchWeek Bloggers are not responsible for the fulfillment or delivery of the prize packages. Bloggers hosting this giveaway and their immediate family members in their household cannot enter or win the giveaway. No purchase necessary. Void where prohibited by law. This promotion is in no way sponsored, endorsed or administered by, or associated with Facebook, Instagram, Pinterest, or any other social channel mentioned in the #Brunchweek posts or entry. Oh my goodness! I bet these are absolutely delicious! I love fruit filled cinnamon rolls! Nichole, I am drooling here. No wonder your coworkers loved it. Love the pairing of blueberry and raspberry – I'm in love with that color!